Hos Dorte: A and B are for.....! Oh so cute!! Thanks so much for playing in our ‘Anything Goes with Dies’ challenge at Dies R Us! Please come back again soon! 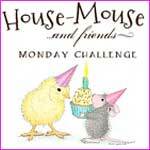 A sweet House Mouse Glittery Card. 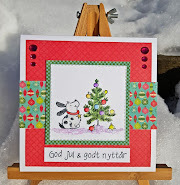 Thank you for sharing your sweet creation with Sparkles Christmas Challenge. This is really beautiful!Thank you so much for joining our Anything Goes challenge at Dies R Us! Lækkert kort i smuk facon. 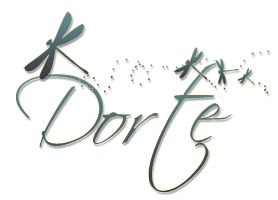 Thank you for sharing your beautiful creation with us at Sparkles Christmas, hope to see you again next time..
What a gorgeous card Dorte! The papers are beautiful and I just love the mouse! Thanks for playing along in our January Craft Heaven Shop Challenge..
Hope to see more of your fabulous makes in the future!